This week’s article comes from Dr. Derrell Peel at Oklahoma State University. I wrote about the cull cow market a few weeks ago (available here) and I found Dr. Peel’s comments today to be valuable info to add to the ongoing narrative on cull cow markets. Above is a seasonal index for cull cow prices. The way to interpret this chart is that an index of 1.00 is equal to the annual average. Since the December index is 0.90, that implies that December cull cow prices are usually 10 percent lower than the annual average. In 2018, we have seen low prices in the May-August time period which goes against the seasonal norm. Dr. Peel discusses this more below. 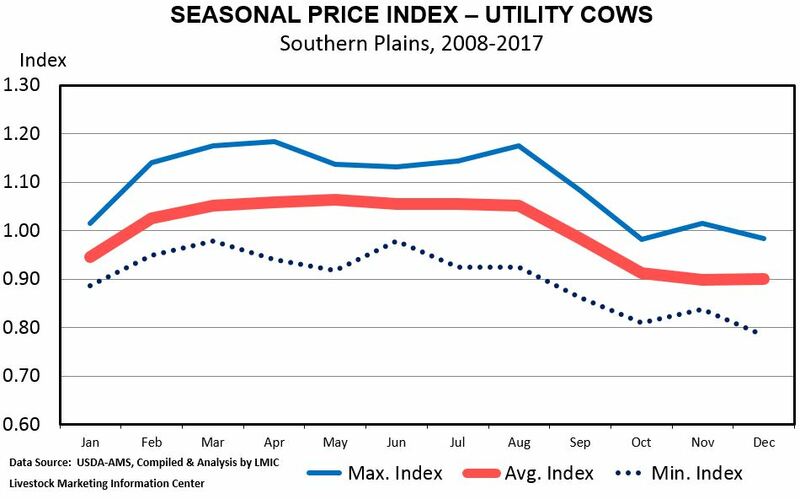 The cull cow market likely reached a seasonal low in November but it has been difficult to understand this market this year. Prices for Breaker cows in Oklahoma City averaged $50.13/cwt. in November, nearly 11 percent lower year over year, while Boning cows averaged $47.88/cwt., over 16 percent down from one year ago. Cull cow prices have been counter-seasonally lower year over year from May through October and have averaged 13-15 percent lower year over year for the last seven months.